Abstract. 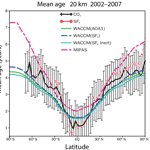 We have used the Whole Atmosphere Community Climate Model (WACCM), with an updated treatment of loss processes, to determine the atmospheric lifetime of sulfur hexafluoride (SF6). The model includes the following SF6 removal processes: photolysis, electron attachment and reaction with mesospheric metal atoms. The Sodankylä Ion Chemistry (SIC) model is incorporated into the standard version of WACCM to produce a new version with a detailed D region ion chemistry with cluster ions and negative ions. This is used to determine a latitude- and altitude-dependent scaling factor for the electron density in the standard WACCM in order to carry out multi-year SF6 simulations. The model gives a mean SF6 lifetime over an 11-year solar cycle (τ) of 1278 years (with a range from 1120 to 1475 years), which is much shorter than the currently widely used value of 3200 years, due to the larger contribution (97.4%) of the modelled electron density to the total atmospheric loss. The loss of SF6 by reaction with mesospheric metal atoms (Na and K) is far too slow to affect the lifetime. 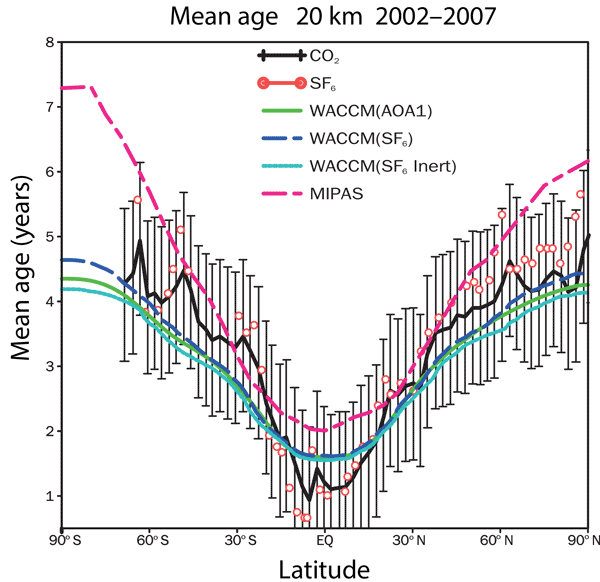 We investigate how this shorter atmospheric lifetime impacts the use of SF6 to derive stratospheric age of air. The age of air derived from this shorter lifetime SF6 tracer is longer by 9% in polar latitudes at 20km compared to a passive SF6 tracer. We also present laboratory measurements of the infrared spectrum of SF6 and find good agreement with previous studies. We calculate the resulting radiative forcings and efficiencies to be, on average, very similar to those reported previously. Our values for the 20-, 100- and 500-year global warming potentials are 18000, 23800 and 31300, respectively. How to cite: Kovács, T., Feng, W., Totterdill, A., Plane, J. M. C., Dhomse, S., Gómez-Martín, J. C., Stiller, G. P., Haenel, F. J., Smith, C., Forster, P. M., García, R. R., Marsh, D. R., and Chipperfield, M. P.: Determination of the atmospheric lifetime and global warming potential of sulfur hexafluoride using a three-dimensional model, Atmos. Chem. Phys., 17, 883-898, https://doi.org/10.5194/acp-17-883-2017, 2017. Sulfur hexafluoride (SF6) is a very potent greenhouse gas, which is present in the atmosphere only through its industrial use, for example as an electrical insulator. To estimate accurately the impact of SF6 emissions on climate we need to know how long it persists in the atmosphere before being removed. Previous estimates of the SF6 lifetime indicate a large degree of uncertainty. Here we use a detailed atmospheric model to calculate a current best estimate of the SF6 lifetime.